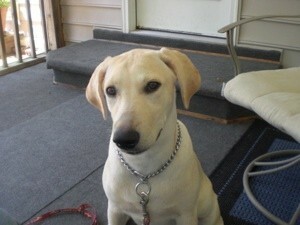 Mr. Bentlee is a 7 months old pure bred Labrador. We purchased our Bentlee from a breeder in Texas so he took his first and only plane ride in May when he was about 12 weeks old. If anyone has seen "Marley and Me" then they will know all about what a lab likes to do for fun. Our Mr. Bentlee is all lab. He loves to run and play fetch. He really loves to chew anything and everything. And his favorite thing to do is to grab whatever he can off the counter and run away with it wanting you to chase him. Bentlee was the least expensive puppy in the litter so we also call him our clearance puppy. Mr. Bentley is gorgeous. My girls also love to run and play and fetch. They are toys.